Dapra Corporation's new Mid-Feed cutters and inserts -- part of its high-feed RHINO-FEED® line -- provide an excellent high-feed milling solution, allowing for extreme feed rates in light- to moderate-DOC applications. Dapra's Mid-Feed line is optimized for cuts of 1.000" to 3.000" diameter and a maximum depth of .045", with 10mm IC (inscribed circle) inserts featuring four usable edges. End mills, shell mills and modular heads are available with two, three, five or six flutes. 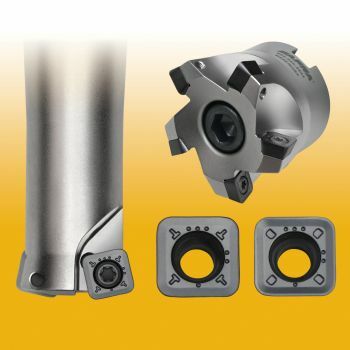 Mid-Feed is well suited for lighter-duty machines (40-taper, linear ways, etc.) running at moderate FPT. Dapra's RHINO-FEED line adjusts feed rates to compensate for the significant chip thinning that occurs during high-feed milling when an extreme lead angle is utilized. Mini-Feed and Heavy-Feed cutters and inserts are also available for diameters from .500" to 4" and depths of cut from .015" to .060".